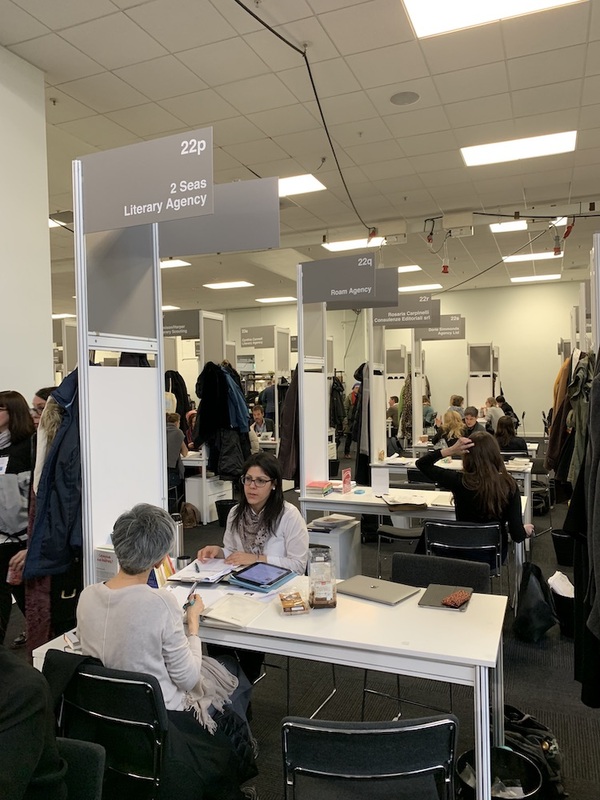 Like in 2017, the 2019 London Book Fair was held in March instead of April. The general impression among acquiring editors, scouts and rights sellers was one of relative quietness, without the usual big, buzzing pre-fair titles. Most —myself included— expressed a clear preference for the usual April dates. March seems simply too close to the Frankfurt Book Fair; many rights sellers didn’t have much new material to pitch. As a result, titles that had already been discussed in Frankfurt were brought up again during LBF meetings, and most London Book Fair rights lists were put together and sent out virtually at the eve of the fair. 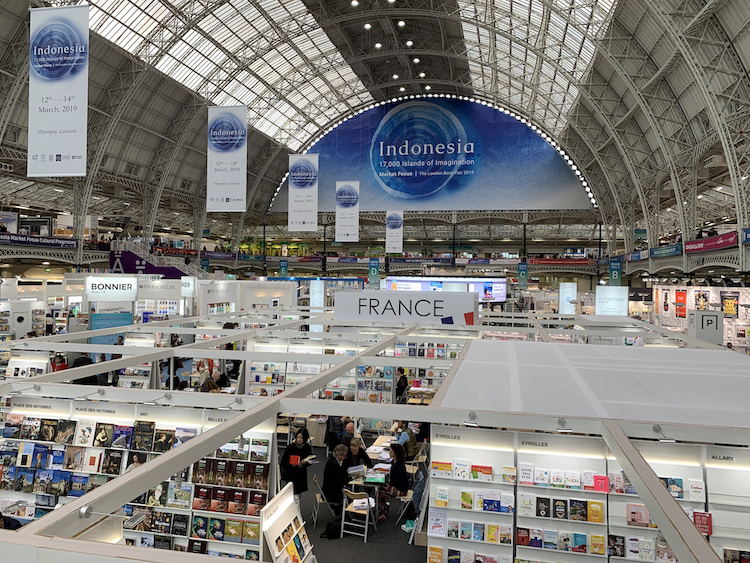 I always aim to finalize our rights lists at least a month in advance, but lo and behold, even 2 Seas Agency’s 2019 London Book Fair rights lists were sent out only 10 days before the fair started! Chrys in action at the London Book Fair! In spite of the madness that was happening a few miles down the road from the Olympia convention center, Brexit wasn’t particularly a topic of discussion, at least not during our meetings. Besides those affected by the strike of the French custom officers (which was/is Brexit-related), which caused cancellations or at best extreme delays for anyone traveling from Paris by Eurostar (normally a quick 2.5 hour train ride), people seemed to be in good spirits. Perhaps because the LBF was so early this year, there wasn’t really any quiet time at the start of the year for us. Besides scheduling for the LBF and the rest of my trip to Europe this spring, two books in particular kept us busy in January and February. The incredibly smart and funny non-fiction title The Psychology of Stupidity, which we represent worldwide on behalf of Editions des Sciences Humaines, has so far sold to 15 territories, mostly in pre-empts and at auction. Cathy Bonidan’s commercial reading group fiction title Room 128 (Editions de la Martinière Littérature) sold to St Martin’s Press at auction, and further rights sales include Germany (Zsolnay/Hanser) and Italy (De Agostini/Planeta), both in a pre-empt. Like last year’s LBF, most interest went out to non-fiction titles during our meetings. There was an abundance in climate-related books (How We’re Going to Save the World. A Manifesto for Climate Justice, from our client Massot Editions, was one of them). WWII-related titles continued to be in high demand, both on the non-fiction side (in our catalog, Hitler’s Horses by Arthur Brand, often referred to as ‘the Indiana Jones of the art world’) and, following the success of The Tattooist of Auschwitz, on the fiction side as well — The Angel of Munich (Longanesi) is a perfect example from our list. A recurrent topic during our meetings was the audio market. The format continues to grow in English-language speaking countries, in particular thanks to streaming services, and the aggressive acquisition strategy by Sweden’s Storytel in a growing number of European and Asian countries has been sparking a debate for a while now. 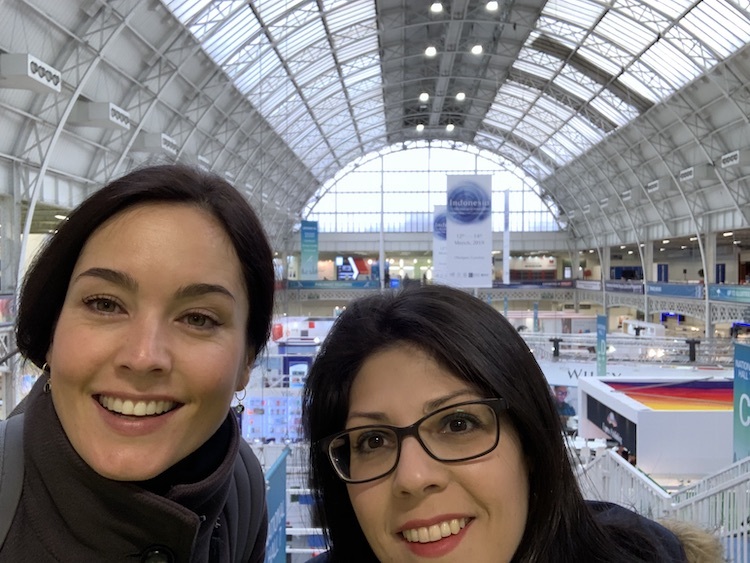 The London Book Fair dates have already been decided on for 2020, and the fair will be held once again in March. But if anyone knows of a petition to bring the fair back to April in the following years, please let me know! 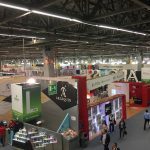 One of the reasons I wasn’t happy with the LBF March dates was the fair’s proximity with Livre Paris (formerly known, and still often referred to, as Le Salon du Livre). The latter’s opening night even coincided with the last day of the London Book Fair. 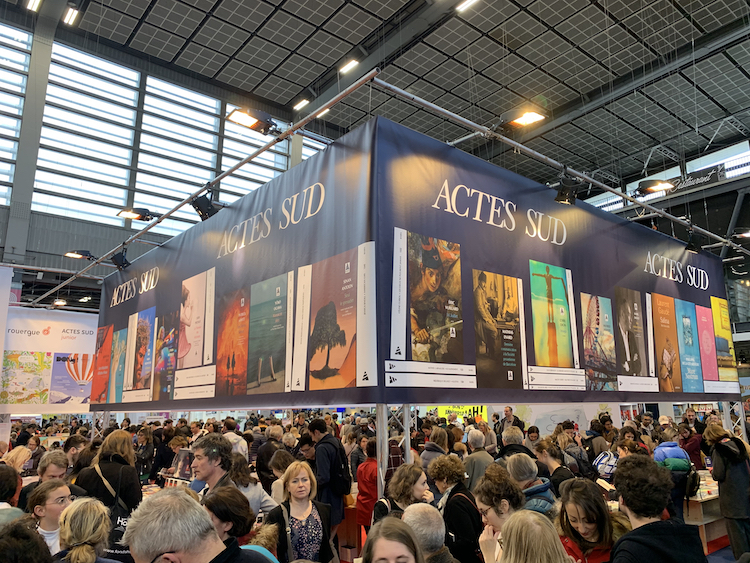 I really didn’t mind starting my spring 2019 Eurotour with the London Book Fair, but attending two book fairs in a row, back-to-back, was a little intense I have to say! Chrys and I skipped the inauguration ceremony at the Porte de Versailles conference center and took the Eurostar to Paris the following day, fortunately without any delays. After one recovery day (which was also grocery shopping and laundry day for me — yes, normal life continues! ), I arrived at Livre Paris on Sunday morning for another full day of meetings. It is a public fair, which means that tons of readers were visiting that day hoping to catch a glimpse of, and have their book signed by their favorite author. 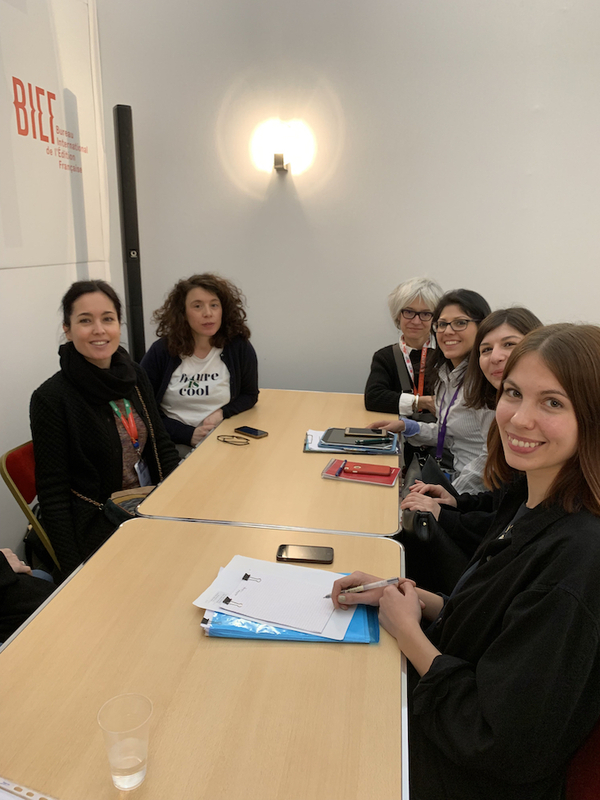 I mostly met with acquiring editors from around the world who were taking part in the annual fellowship organized by the Bureau International de l’Edition Française (BIEF), those on international literature, or who had traveled to Paris on their own account. I was glad to see an increasing number of Dutch editors this year! In Paris, Chrys and I were also very happy to finally meet our current intern Nikoleta in person! She is based in Paris year-round, and joined us for one day of meetings at the Paris Book Fair. Talking about seeing the heat of the action! The sale of Dutch rights continues to play an important role in the agency’s activities, and a visit to Amsterdam every 6 months is necessary to nourish my relationships with Dutch publishers and deepen my knowledge of the Dutch market. Plus, several publishers moved since September so it was great to see what their new offices look like. The Meulenhoff team introduced me to Hendrik Groen’s new title A Small Surprise (a prequel to his first bestseller Attempts to Make Something of Life, translated in 36 territories) while we enjoyed the magnificent view on Amsterdam from their 16th-floor conference room. n Rushdie in 2001). 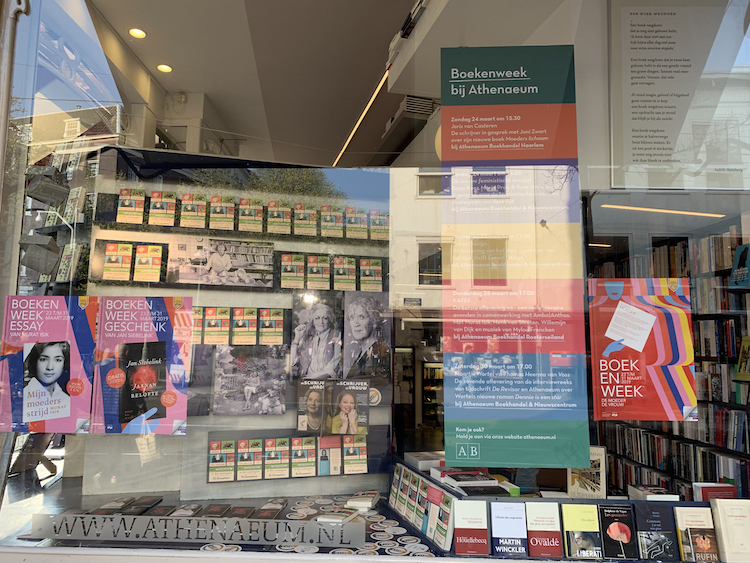 The bookstore buys the books from the CPNB and, during Book Week, gives one copy away to every customer who spends at least EUR 12.50 on a Dutch book (whether it’s an original Dutch work or a book in translation). The Book Week gift is truly a phenomenon. In recent years, its print run has exceeded 750,000 copies; this means that it reaches one in eight households in the Netherlands during the ten days of Book Week, and that 750,000 customers have gone to a bookstore and bought at least one book each. Further information about this unique initiative can be found in the notes of my webinar about the Dutch book market (September 2016). Dutch publishers are busy developing audio and e-book streaming possibilities with partners such as Kobo and Storytel. E-book library lending which, like the audio book, still represents a relatively small market share, is also a sales format they are investing in. 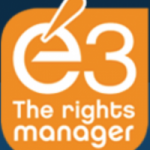 Yet at this point they don’t always seem to get support from foreign rights holders, as it often is unknown territory. The Dutch market went through several rough years around 2012-2014 but the atmosphere has been cautiously optimistic when I visited Amsterdam the last couple of years. The market grew slightly in 2018, though it remains challenging especially for fiction in translation. 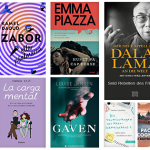 A few exceptions aside (Lucinda Riley, Paolo Cognetti), it seems more challenging than ever to successfully place an unknown, foreign fiction author on the Dutch market. Paolo Cognetti’s The Eight Mountains (De Bezige Bij) is still prominently placed in bookstores a year and a half after it was first published, together with his Wild Boy that was published last year. Ilja Leonard Pfeijffer’s bestselling novel Grand Hotel Europe was prominently placed in all the bookstores I visited — Chrys sold Portuguese rights to Porto Editora on behalf of its Dutch publisher De Arbeiderspers, and we are conducting a French auction at the time of writing! Another Arbeiderspers author who couldn’t be missed when entering a bookstore was Michel Houellebecq, whose Serotonine was just published in Dutch. 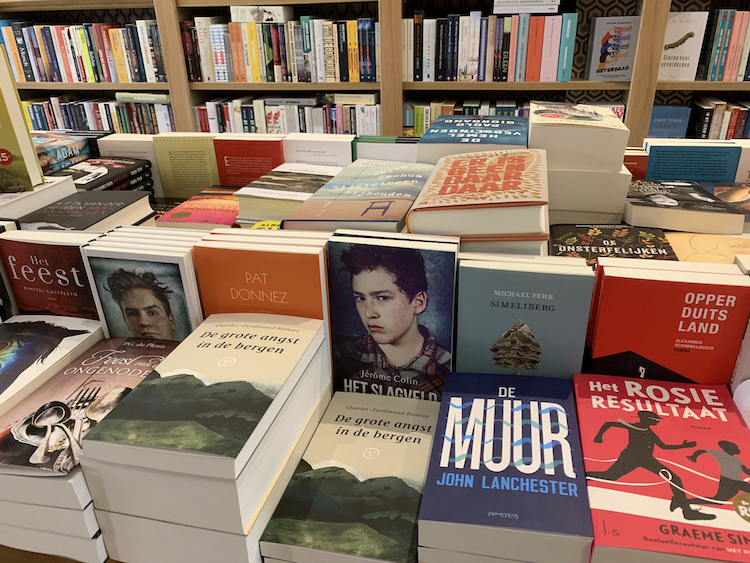 Also in the bookstores, English language editions continue to increase their presence among Dutch titles, in particular for non-fiction and Young-Adult titles. This makes it increasingly difficult for Dutch publishers to invest in a translation — these English language editions are often less expensive as they aren’t subject to a fixed book price. A direct result is a higher demand among Dutch publishers of foreign titles from languages other than English, which is not something we’re going to complain about! While flying back to California my thoughts drifted to my next trip: New York at the end of May, for the New York Rights Fair which I also attended last year. I quickly managed to put those thoughts off till later and simply enjoy the flight, listening to David Sedaris — one of my favorite authors — narrate his latest book Calypso. Time to get some rest!